I’ve been playing The Elder Scrolls V: Skyrim for a grand total of about 12 hours now, and my feelings on the game are mixed. I’ve rarely finished playing through an RPG, the rare exception being Bioware’s Mass Effect, but I am a big fan of the idea of fantasy-based Role Playing Games. I love the idea of walking around a medieval-styled world wielding husky swords, round shields and powerful magicks. I really enjoyed what I played of the previous Elder Scrolls outing, Oblivion, but I have yet to finish the story. From every pre-release snippet of information of Skyrim, I fell more in love with the game, and when it was released I fell in love all over again. It doesn’t have a long, drawn out introduction before you can run around in the world, something that bothered me in Dragon Age: Origins to no end. It throws you pretty quickly into the game and world, letting you move along at your own pace. Explore, hunt, or follow the main quest. All these options are open to you within the first hour. I’d killed my first dragon (with help) by the end of hour 2. It was amazing. Then I realised something that started to grate on me. If anyone has played Magicka, you’ll understand the power each character controls. It’s an action/adventure game with a magic and fantasy setting. You control a character who wields up to 8 magical elements and combine them together for a myriad of effects. Some elements cancel the other out, some complement each other and boost the amount of destruction you can unleash on entities. When playing multiplayer, crossing different beams of elements can lead to amazing combos or ultimate destruction a’la the Ghostbusters movies. I was also very impressed that magic affected the world you played in. From weather effects to freezing rivers and lakes, Magicka’s magic effects may only last a few seconds, but it’s impressive to use. And this is what I wish Skyrim had included a little of. I’m aware that Bethesda were not trying to make a Magicka-influenced game, but with the cool hands-are-your-triggers controls of Skyrim, I was hoping that I could freeze a river with my ice spells. 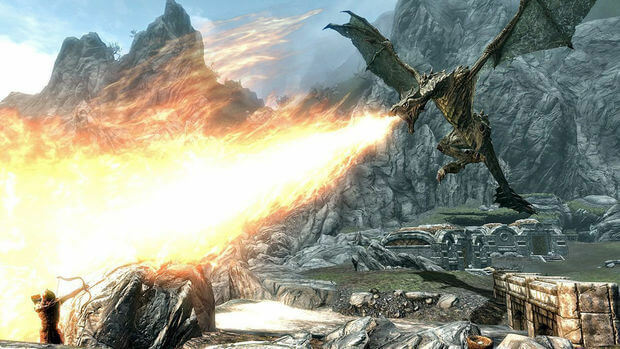 I also wish dragons would actually burn stuff. Let’s get to the dragons then. The Dragons are awesome. They swoop, roar, breath fire or ice, shake the ground when they land and turn the sky dark when they appear. My first dragon I led to a fort I was close to. The bandits attacked the dragon (yay, enemy of my enemy) and the dragon killed them very quickly with his lovely fiery breath (yay, awesome dragon). My issue occurred when I realised that the wood wasn’t burning after being blasted. And it didn’t burn when I tried to set them alight with my own fire spells. I wouldn’t say it annoys me, it just wish it was there. Now my magic spells just feel bland, they only work on NPCs. But, focusing, the dragons are arguably the most important feature of the game. When I meet one, I really want to avoid it, I’m all too aware of its power. I feel scared of the dragons, which is exactly what I should feel. I see I dragon, I shout “Oh fu(dge)” and try to get to higher ground for better aim, or I try to run away. Skyrim is a great open world experience that I’m just starting to really get into, and it’ll be a few hundred hours before I can put it down and walk away. And yeah, the dragons are nigh-on perfect. They just don’t set the world alight.